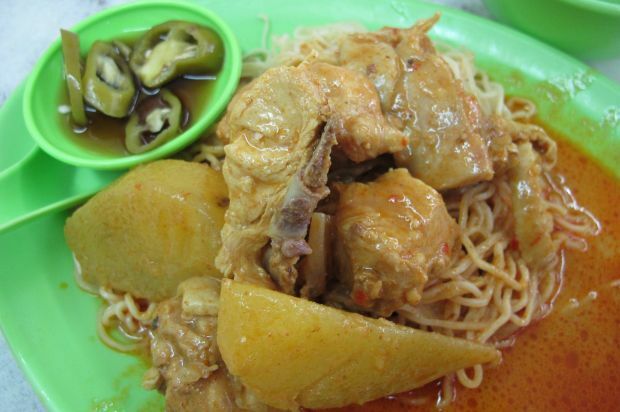 In this week’s edition of the Food Trail, we take a look at Taman Tun Dr Ismail’s kari laksa. But before I get to the low-down, here’s wishing James Lam, my makan kaki all the best after 16 years of service with The Star. Lam is moving to greener pastures and after treating him to a couple of rounds of amber fluid and I’m sure he’s a happy man. 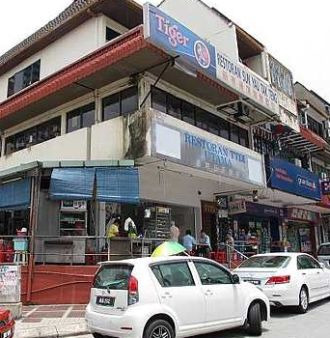 Alright, moving on, there has been much talk about makan in Taman Tun Dr Ismail. Familiar landmark: The corner coffee shop in Taman Tun Dr Ismail. But frankly speaking, parking is a nightmare at this place. Speaking of which, the best way to overcome this is by taking public transport. I prefer to get to this part of the township by riding my folding bicycle. But the biggest challenge here is arriving safely at the coffee shops and makan places without getting maimed or killed. That said, I was put off with the idea of having lunch in this part of town and my break came — thanks to Lam again, for offering a ride to Jalan Tun Mohd Fuad 2 where some good makan places are located. This time, we found our way to a TTDI Utama coffee shop located at a corner lot in Taman Tun Dr Ismail’s busy commercial area. There, I found a stall selling kari laksa and the lady who runs it told me that she had only two servings left. Decent fare: The stall’s kari laksa lacks a few key ingredients, but it was tasty. “Wah! this place must be good ah, they sell out so fast,” said Lam. After working up a good appetite, I ordered a bowl of laksa with gravy while Lam had the dry curried noodles. It didn’t take long for the order to arrive and each serving cost RM4.50. That was my treat to Lam who has been my lunch buddy for at least two years. “Eh, now that I am out of the scene, can we still go out makan ah?,” Lam asked. “Aiya friend, you will be on the Samo Makan Club mailing list la!,” I joked. 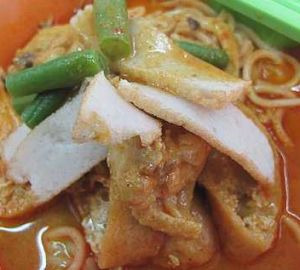 When it came to grading the food at TTDI Utama’s Kari laksa stall, Lam said the taste was pretty decent. He gave it 6 out of 10 on the Lam-scale. I would say that the kari laksa that I ate was quite good but it lacked several key ingredients that would make it even better. Since the owner used curry chicken and potatoes as its main ingredients, the curry gravy ended up being rather mild. So, for RM4.50 a bowl, having met all the criteria of a good bowl of laksa with the Sister’s Kari Laksa in Sea Park as a benchmark, I’d say that this stall scores a 5.5 out of 10 on the Samo-scale. I was told that there’s a better kari laksa stall opposite Taman Tun’s Kentucky Fried Chicken and this will be next on my eat-list. TTDI Utama coffee shop (GPS N 03 08 438, E 101 37 757) opens daily for lunch and is located off Jalan Tun Mohd Fuad 2.